Like a lot of people, I thought that my children with ADHD were just “not trying hard enough” or didn’t “want to” do their schoolwork. While that may have been true on occasion, it didn’t explain the frustration, tears, and occasional tantrums I saw during our homeschool lessons. It also didn’t explain why Tigger’s schoolwork seemed to get worse when I had her sit down and study quietly. That one really puzzled me for a while. I just knew that if I could get her into a quiet place, she’d concentrate better and her work would improve. Wrong. Totally wrong. But that was because I didn’t have any knowledge about how the ADHD brain works. 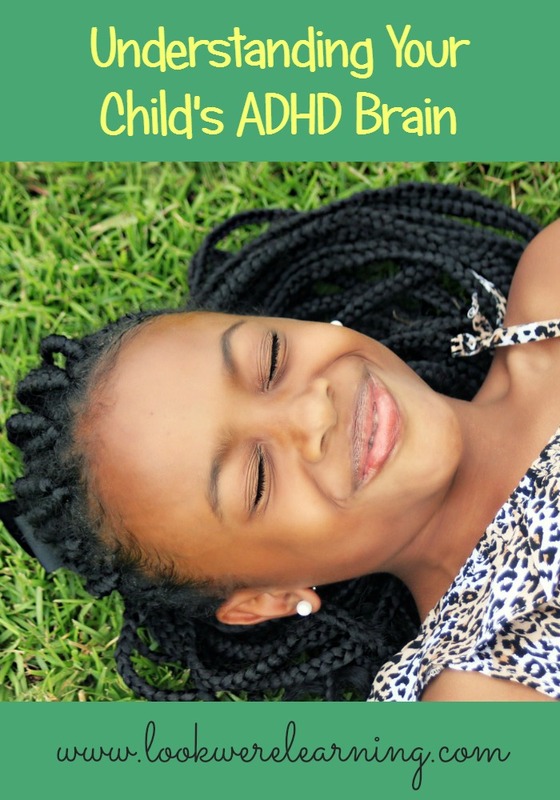 Now, I’m in no way a doctor, but I have read some great information about what happens in the brain of someone with ADHD and I’ve learned how I can use that to help my kids learn better. Here’s what’s so insidious about ADHD: The brain of a person who has ADHD tends to “switch off” during intense concentration. Naturally, the entire brain doesn’t shut down, but the communication between brain sections can go haywire, affecting executive function. Executive function refers to our ability to begin tasks, focus on them, finish them, and manage our emotions throughout. Naturally, if our kids can’t organize their thoughts to get started or sustain focus long enough to finish an assignment, there are going to be tears during school time. And these symptoms get worse if the task is harder. So, when I would tell Tigger to “sit down” and “focus”, her ability to concentrate actually decreased. I was sabotaging her and I didn’t even know it. And all because I simply didn’t understand how the ADHD brain works. Of course, when I started looking at her symptoms, I saw the very same things in myself. Go figure. Instead of trying to work in a peaceful, sedentary environment, kids with ADHD literally NEED to move. During physical movement (or sometimes just afterward), their brains perform executive function duties in a much more efficient way. The movement doesn’t have to be vigorous or involve the whole body, either. Sometimes just small movements will do the trick. That’s why you might see your child with ADHD tapping his or her foot, chewing on a pencil, or shifting in his or her seat so often. Their brains need the movement to concentrate. Hand fidgets and squeeze balls are excellent for this. By the way, I’m collecting some ADHD Friendly Recipes that I’ll be trying with our family soon. Feel free to follow my ADHD Friendly Recipes board on Pinterest for ideas! Follow Selena – Look! We’re Learning!’s board ADHD Friendly Meals on Pinterest.This post is part of our “31 Days of ADHD Homeschooling” series! Stop by tomorrow for Day 5: Sifting Through the Different Types of ADHD! I homeschool a child with ADHD and can COMPLETELY relate to all you are saying! Some days I want to scream but it’s in those moments that I am forgetting how her brain works! Thank you for sharing and I am going to stay tuned to pick up some tips! Can I come scream with you? 🙂 I totally understand and it is rough to remember that there are times when they truly cannot process information efficiently. I’ll be talking about tips for parents in this series too. I LOVE this! Great insight. I read this post to my kids and they totally agree that they work better with movement. So my son will try chewing gum in the classes that allow him to. Of course I’ll give then more flexibility at home now that I know their fidgetiness is legitimate. Oh, and this recipes look delicious! Great explanation! Like you, at the beginning of this journey, I thought the things my child was doing were just to push my buttons and make me crazy. I have become much more understanding and patient since receiving the diagnoses we’ve gotten. Hey Jennifer! It really can feel like they’re doing stuff on purpose, right? And sometimes they are, because they’re kids. But those recurring behavioral patterns that they can’t seem to stop are generally a result of the condition and that’s why it’s so important that parents learn all they can about it.